Excerpts from Assignment in Modelling. 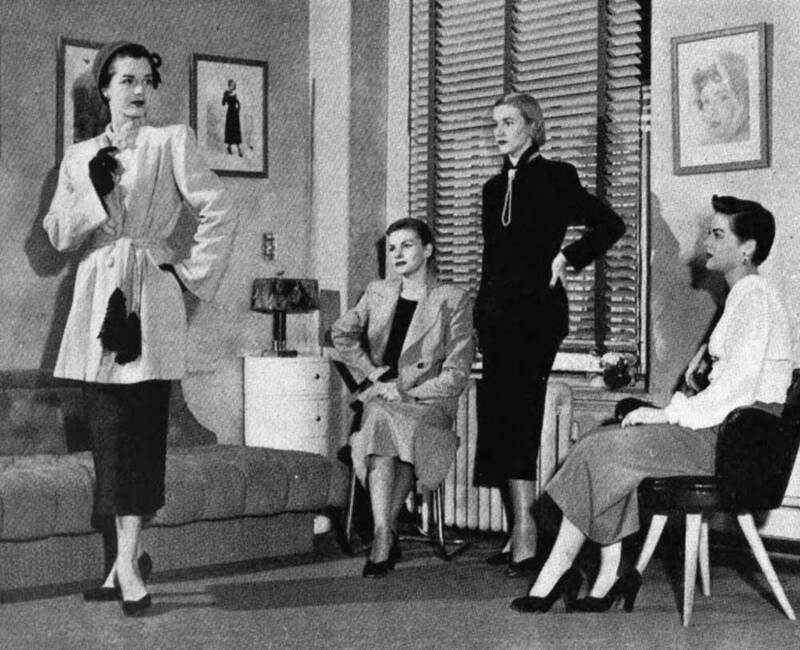 Here are some photographs of a typical day at the Barbizon School for fashion models in 1950 in Florida. 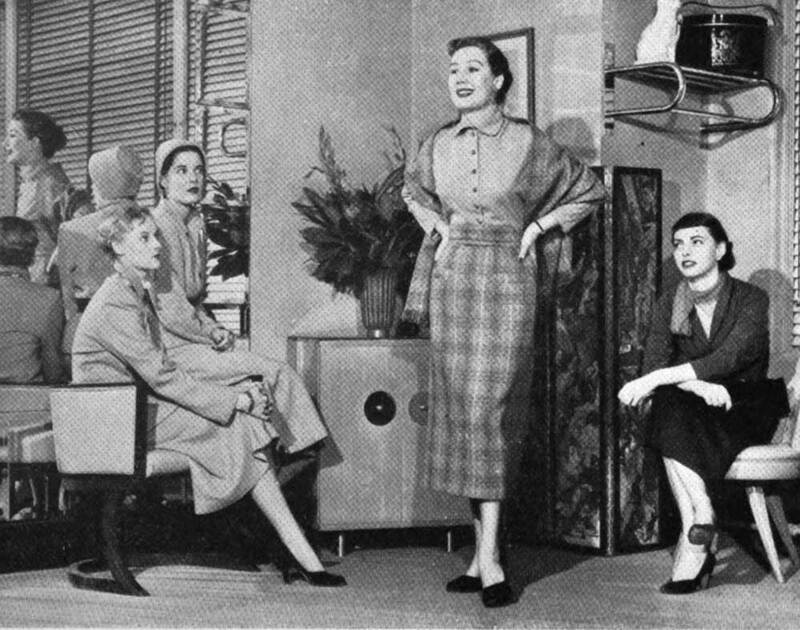 The school was founded originally as a ‘charm school’ in 1935. 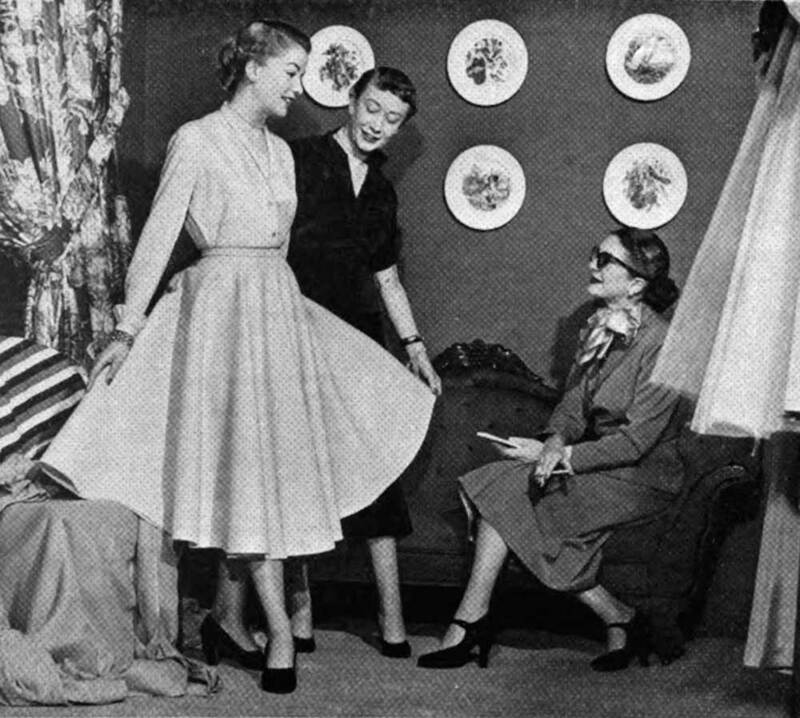 Barbizon training scene pictures Bettellen in semi-ballet stance with legs widespread to feature the skirts fullness. 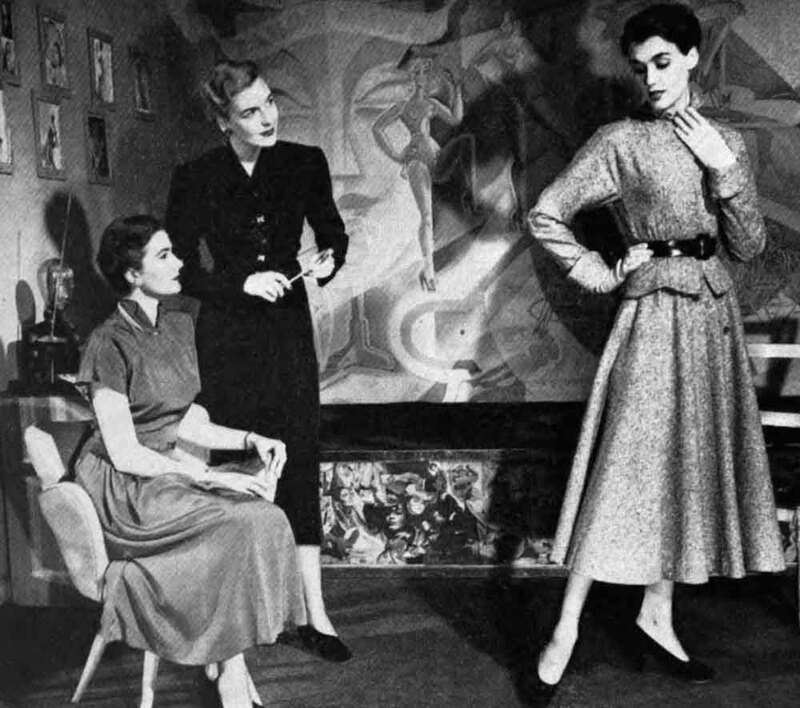 “She must equip herself with the fluid motion and relaxed appearance of the experienced model.” Kim Garret leads Barbizon students into a forward stride, with the foot arched, toes pointed straightaway, the hips moving directly forward with the stride. “The back should be straight, the shoulders held square and even, relaxed but controlled.” Barbizon instructor Jean Davis shows lovely Janet Helthal how to hold shoulders back, bosom high, and hips tucked in and under. “The greater amount of knowledge she can amass to begin with, the better will be her lot.” Students and instructor watch Shirley O’Hara completing pivot by drawing up the weight-free foot to the other and flexing the knee. Pivoting can make or break a girl’s showing. 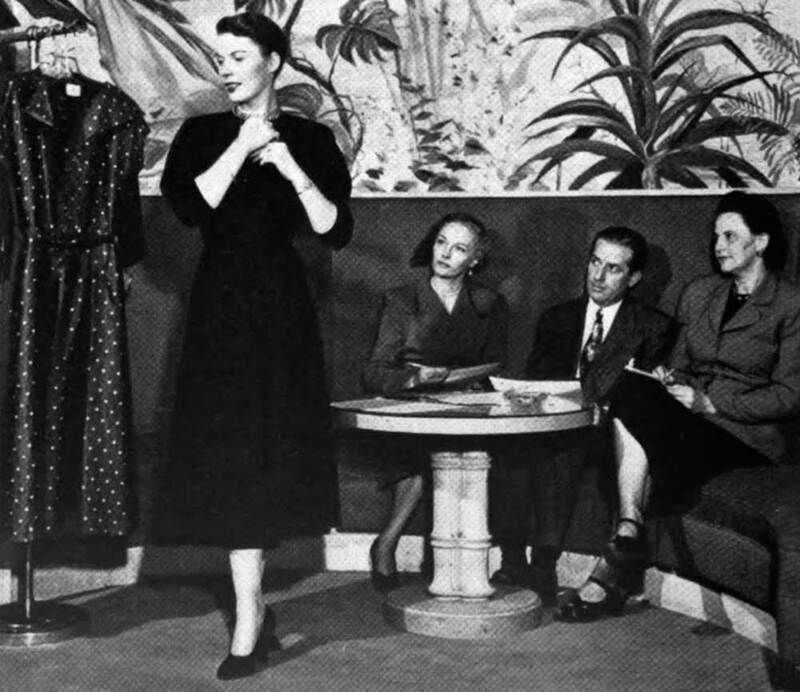 “Wholesale houses require models who are quick, sure and graceful.” Buyers inspect a bolero cocktail dress as Sande Vandersande, house model for Henry Rosenfield, shows it with an air of smoothness, sleekness, and dignity. 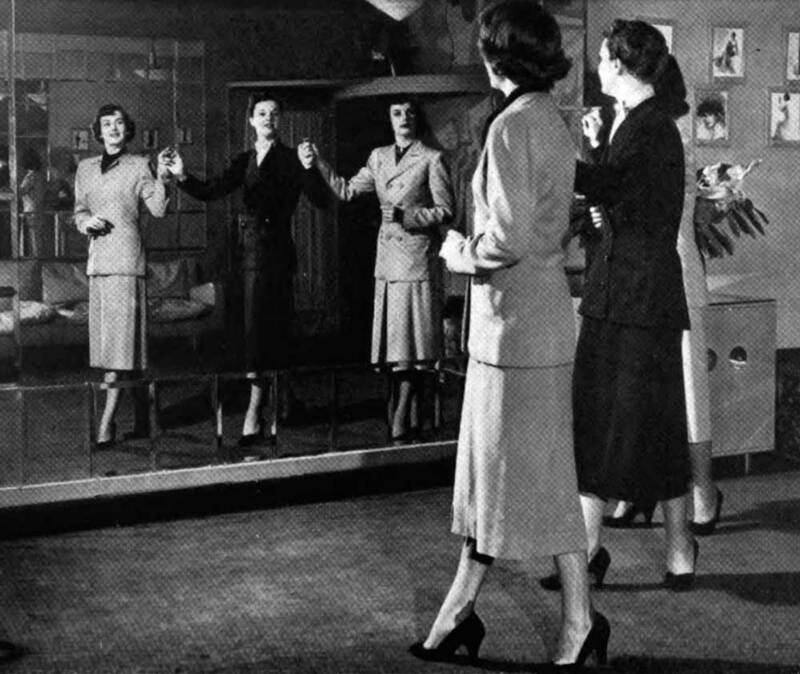 “Presenting the costume of the moment in its best light is within the reach of every girl who has the will to learn.” Typical Barbizon training scene shows Paulette Hendrix taking her turn in showing details of a coat. An air of composure and a pleasant smile add to the effect of smartness. 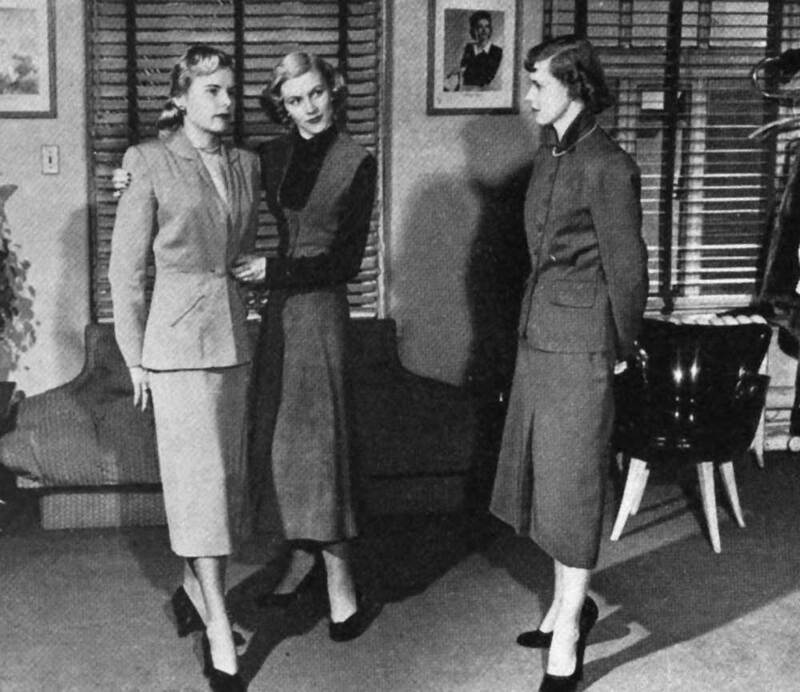 ” Many double as both sample and showroom model.” Blond Georgia-born Connie Gallagher on whom Toni Owens designs his smart casual clothes models a two-piece “fireside” outfit for Patricia Coffin, editor of Look Magazine. 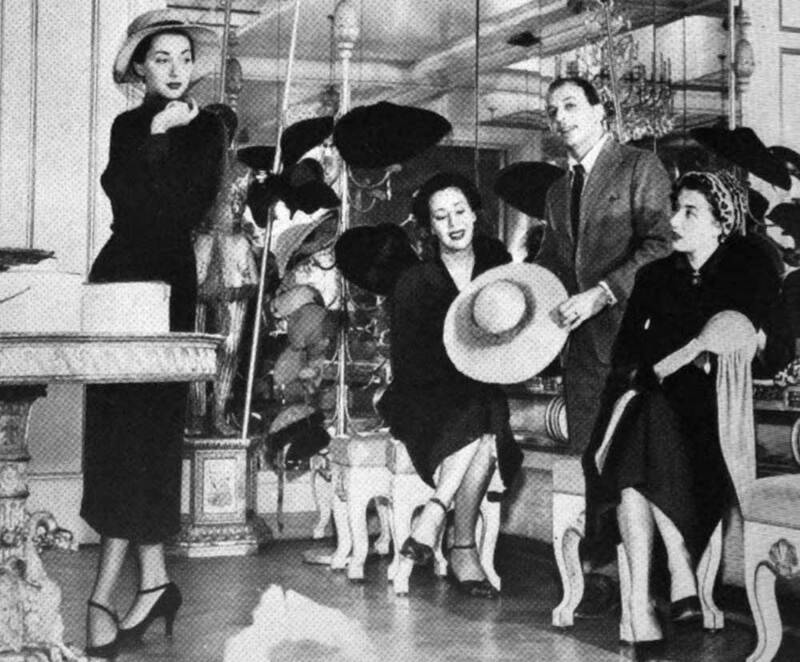 “They enjoy their contact with an elite clientele, and working with famous designers.” Midge Ware models a spectator sports hat in the salon of Mr.John, noted millinery designer. 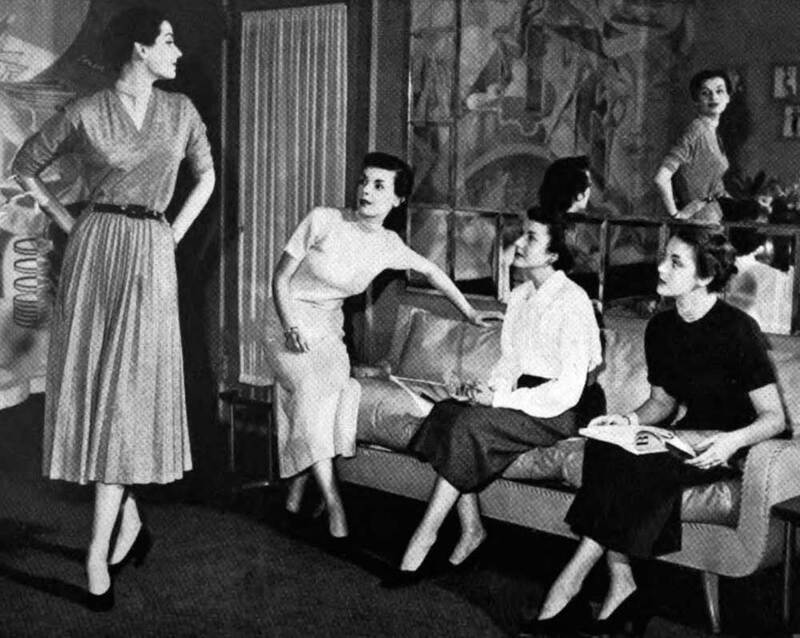 ” The hands can be prominent aids to the beauty of a picture or detracting factors to be made as unobtrusive as possible.” Barbizon students watch Hope Bryce demonstrate a sleek fashion pose with arms akimbo, hands flattened, and fingers raised.